Since my first introduction to the Parklands region of S.W. 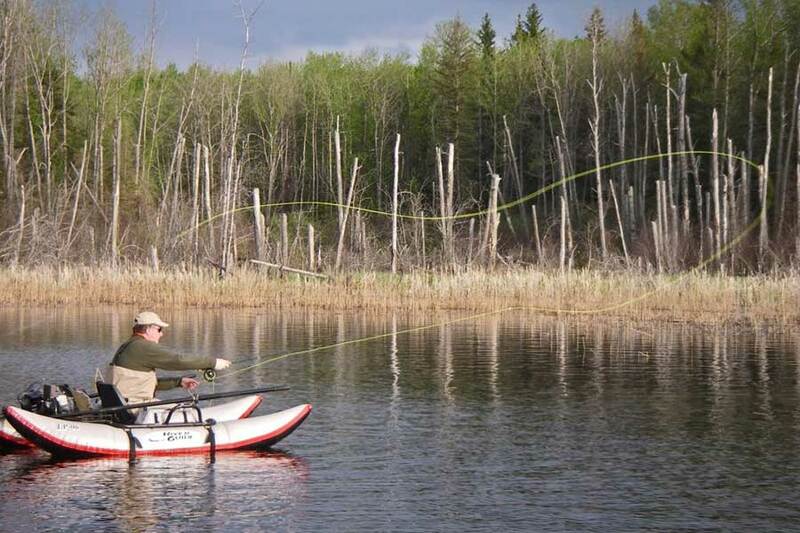 Manitoba over 10 years ago pilgrimages to this stillwater trout Mecca have become an annual event. 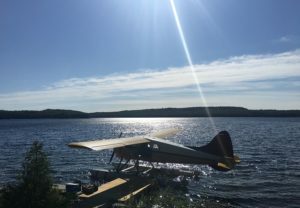 Over the past five years, I’ve been spending at least four weeks per season exploring this trout-rich region, a minimum two weeks in the spring and two weeks in the fall. With each passing season, I am able to add a few more files to my personal database by exploring different areas within each lake and experimenting with new tactics and presentation techniques. 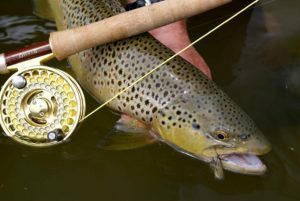 One of the most important aspects of any Parklands trip is ensuring you have an assortment of fly lines to match the conditions and where trout tend to locate. Depending on the specific lake or time of the year this could mean shallow, deep, or a blend of both. 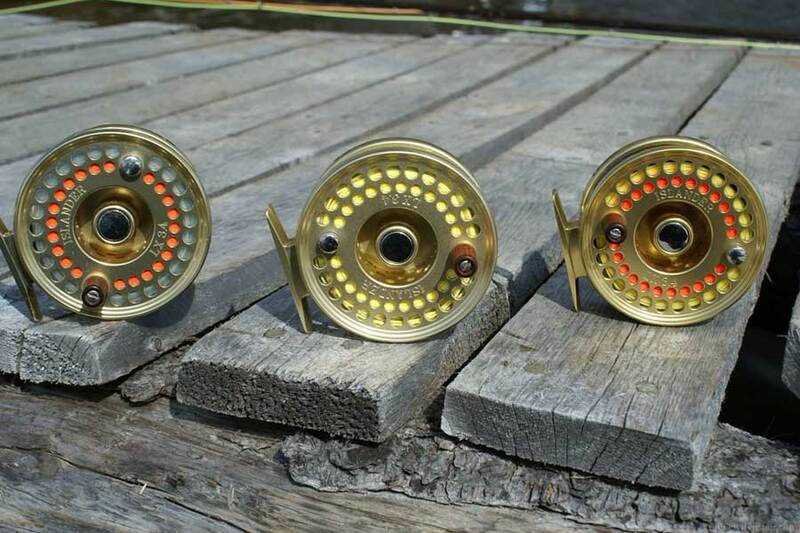 My preferred fly line choices fall into two categories, essential and niche. Essential lines are those I always take with me. Niche lines are useful extras which allow me to fine tune certain presentations or manage specific challenges. My essential suite of “never leave home without them” lines includes: floating, clear intermediate, and fast sinking (type V). If I was restricted to only one fly line option, it would, without a doubt, be a floating line. This preference is no different for the Parklands. In fact, my Parklands experience over the years has only reinforced this belief. The reason behind my floating line devotion is simple—versatility. I can cover a wide range of water using a floating line, from as deep as 25’ to as shallow as five feet or less. During late the spring and early summer, when Parklands trout concentrate on emerging chironomid pupa, these scenarios play themselves out almost daily. Another primary reason for ensuring that a floating line is included in your kit bag is its necessity for strike indicator presentations. Strike indicators have exploded in popularity on lakes. Once the domain of those imitating chironomid pupa and larva we now use strike indicator techniques when trout are targeting other foods sources including leeches, baitfish, damsel nymphs, scuds and dragon fly nymphs. Due to the strike indicator’s facility for controlling two key presentation elements (depth and retrieve speed) flies representing any stillwater forage item can be successfully suspended beneath an indicator. Floating lines are also an excellent choice for casting and slowly retrieving weighted patterns. By varying the leader length, sink time, pattern weight and retrieve speed, it is possible to cover water up to and in excess of 20 feet deep. 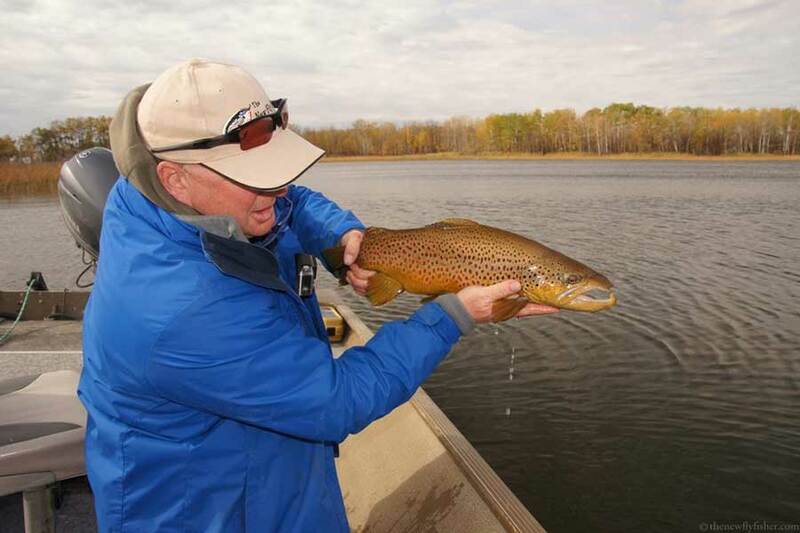 For this approach, use a standard 9-15 foot leader with a fluorocarbon tippet. The varying thickness of the tapered leader causes it to sink in an arc. Consequently, leaders need to be 25% longer than the depth of the water. For example, to prospect 16-feet down requires a 19-foot leader. Retrieve speeds should be slow to moderate—any faster and your flies will climb up out of the 1-3 foot zone just above the bottom where trout most often forage. 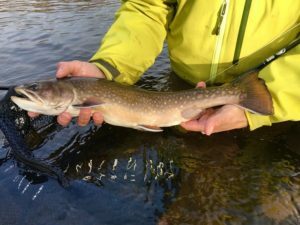 During the fall months when trout actively patrol the shallows stocking up for the long winter ahead, a floating line coupled with a 12 foot leader and balanced leech or minnow pattern works wonders. Look for floating lines featuring aggressive head designs. Lines originally designed for nymphing on rivers (where large indicators, weight on the leader and heavily weighted flies are the norm) make excellent stillwater lines. The aggressive head design facilitates casting long leaders and indicator rigs, as well as offering a large surface area which aids mending The large surface area of nymph line also provides greater surface friction to help load rods for roll casting. I use roll casts often, particularly when using strike indicators. 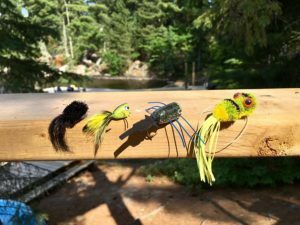 Indicators and multiple weighted flies are tangle prone, and the roll cast keeps them in the water until the final rod push. As a result flies have little opportunity to tangle. I use low or no stretch lines whenever possible. Traditional,braided Dacron core lines stretch up to 30%. Newer, low stretch lines, stretch 6%, providing a number of advantages. 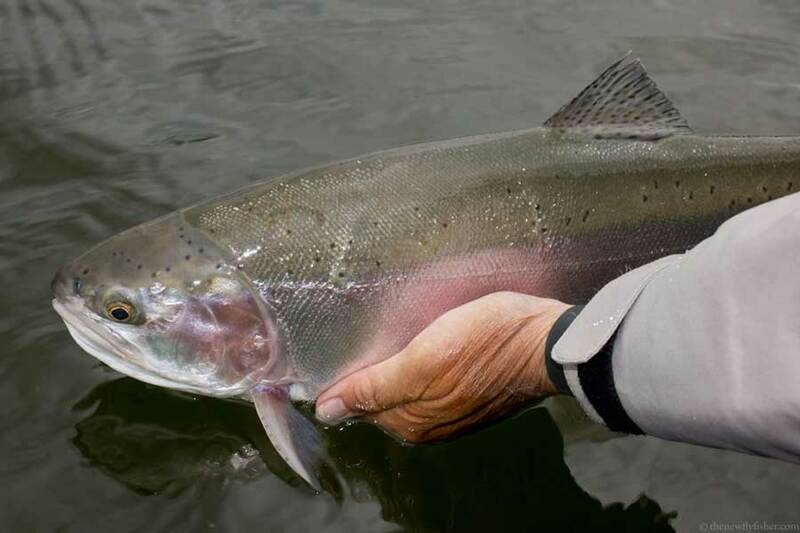 Low stretch lines offer superior bite detection, enabling quicker reaction times and, consequently, fewer missed fish. The low stretch core also aids casting, as the reduced elasticity of the line allows for a more efficient energy transfer from rod to line, increasing both casting accuracy and distance. Finally, low stretch lines allow you to play fish quickly, as the rod movements during the fight transfer directly to the fish—nothing is lost to line stretch. Clear intermediate lines are a stillwater essential. Many stillwater fly fishers are attracted to the transparent or semi-transparent nature of the clear intermediate, as it provides an element of stealth—significant benefit when faced with clear water conditions. Clear intermediate lines are ideal presentation tools for Parklands trout which are foraging shoreline margins and weed edges in search of leeches and minnows. 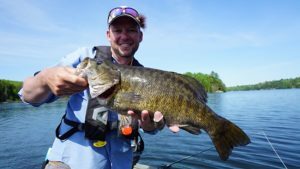 For those who prefer to fish out of a pontoon boat or float tube, a clear intermediate is an ideal line to troll parallel to the shore or to prospect weed pockets and openings. The slow sink rate of a clear intermediate line is an often overlooked benefit. Depending upon the manufacturer, most clear intermediates sink between 1.5 and 2-inches per second. This pedestrian sink rate allows a slow, natural, horizontal presentation that mimics the pace and travel path, with minimal hang-ups, of most stillwater prey. Higher sink rate lines get your fly down fast, but if trout aren’t active, they aren’t likely to chase a fast moving fly—and fast sinking lines don’t permit slow retrieves, which results in flies spending more time in the weeds than in a trout’s mouth. A fast-sinking, type V density-compensated line is the final line within in my essential Parklands fly lines trifecta. The type V line allows you to explore deeper reaches that a clear intermediate line would take too long to reach. If trout are active, aggressive and willing to chase leech or minnow patterns moved at a brisk pace or attractors such as a Booby, fast sinking lines are your best friend. Time isn’t wasted waiting for lines to sink before retrieves can commence. A type V line is also an ideal choice for those who prefer to troll, as it is less likely to ride up in the water as you paddle along shoreline structure or over expansive weed beds. Density compensation is important consideration. Traditional non-compensated sinking lines concentrate the tungsten powder used to sink the line in the thicker diameter mid-section or belly section. As a result, traditional sinking lines sank in a ‘hockey stick” manner, the thinner tip section, leader and fly trailing behind and higher in the water column—a profile that can result in missed fish, as the take has to travel along the curve of the line to be detected. Density compensation adjusts the placement of the tungsten powder so the line sinks tip first providing a direct connection between the angler and the fly. It is important to note that slow-sinking lines, such as the clear intermediate, are not density-compensated. Fast sinking lines offer an exciting option when trout are feeding on emerging chironomid pupa in water 15 feet or greater—a method referred to as “dangling”. Here’s how to dangle. From an anchored position, measure out a length of line and leader one foot shorter than the depth of water you are anchored in. To set up your line, attach a weight, such as a pair of forceps, to the fly at the end of a short (3’-5’) leader. Lower the forceps into the water and allow them to pull the line and leader to the bottom. Begin winding line onto the reel until the forceps lift off the bottom. The rod tip bends down sharply as this happens. Reel in another foot of line to finalize the measurement. Strip in the remaining line, remove the forceps, and cast. The cast might seem short, but avoid the temptation to strip off more line—remember, you measured the line and leader, so you know the length is correct. Allow the line, leader and flies to sink completely, so that they hang directly below the rod tip. Get comfortable. Let the flies dangle for as long as you can stand it. If boredom creeps in, begin a painstakingly slow hand-twist or a one-inch pinch strip retrieve. 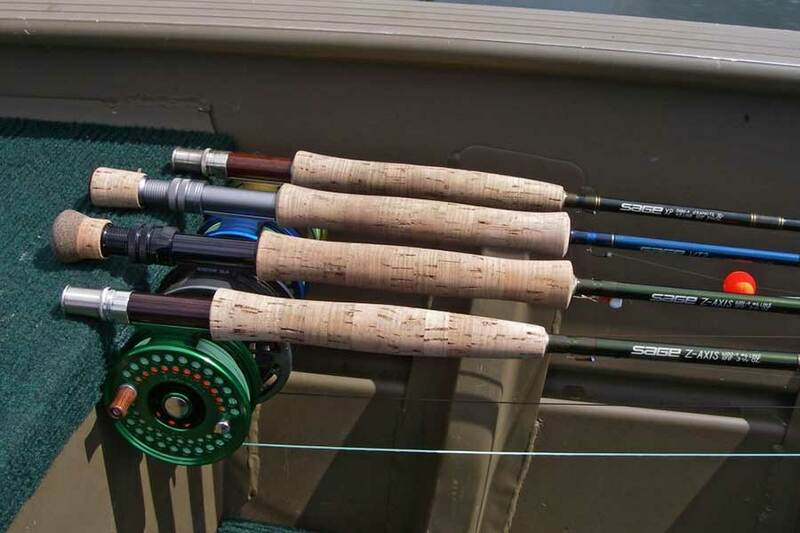 When the leader reaches the rod tip, cast and repeat the process. Contrary to most other chironomid presentations, dangling takes are typically savage. Do not let go of the rod for any reason, as it could be ripped overboard, as reduced-stretch lines compound the magnitude of the grab. Takes often occur just off the bottom or as the fly nears the surface. Often the trout follows the fly up and takes it down and away a few feet beneath the surface. The adrenalin rush of the smash takes is difficult to resist. 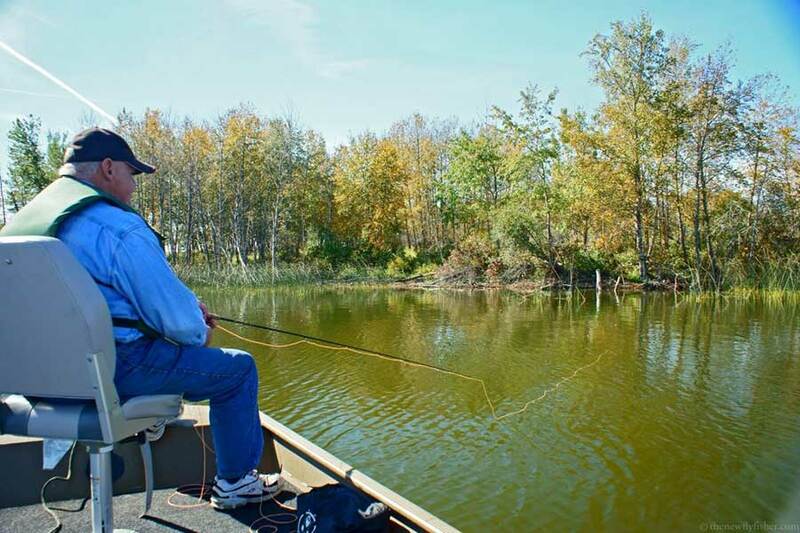 As you are fishing within the radius of your boat, you may have to move around to find fish when dangling. Use a sounder if you can and check the surface for shucks signalling signs of a recent emergence, or birds concentrated over a specific area as clues to where feeding fish might be. Deep flats adjacent to points and drop offs are favored dangling locations. Trout often hold near these transition areas, making forays from the security of the deeps into the nearby shallows to feed on emerging chironomids.